I am still not trading today but I can be watching. 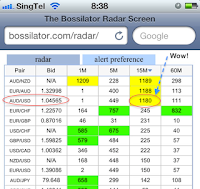 I just love the new Bossilator radar screen on my iPhone. Look at that $AUDUSD 15M Bossilator. 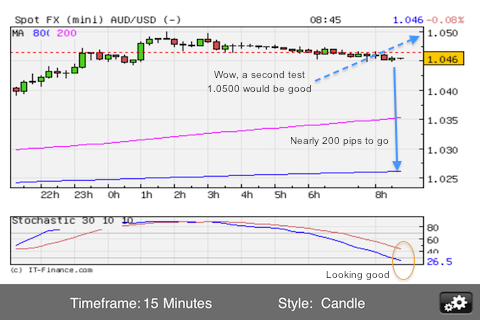 That's 1180 candles away from the SMA800. That is what I call a WOW! reading. I really didn't want to go into Windows and open up MT4 (yes, I run MT4 on WinXP on Parallels in a MAC, it works like a charm), so I was fiddling around the iPhone. Look what I found in my broker's mobile app charts. Rudimentary but it does tell the story. 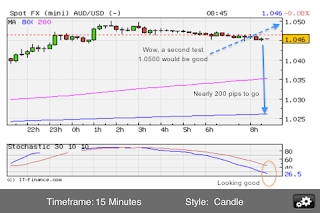 Niiiice.....the SMA800 (in blue) shows up ok.
Looks like AUDUSD has about 200pips to go before it heads down to the SMA800. Oops, stochastics is heading down to oversold, so we will really need it to go back up to overbought for the setup to take action. All hands on deck for the London session. I should be back home in time for London open. And yes, I am still watching today...no trading for the next 24 hours.